The two gunmen who opened fire at a school in south-eastern Brazil and killed at least five teenagers were former pupils, officials say. The shooting happened at about 09:30 local time (12:30 GMT) when the students were on a break at the state school in Suzano, near São Paulo. Two school employees and the owner of a nearby shop - from whom the attackers stole a car - also died. The gunmen, aged 17 and 25, both killed themselves after the attack. Police say they found a revolver, a bow and arrow, and items that appeared to be explosives. It is not yet known why the former pupils attacked the school - and while gun crime is common in Brazil, shootings of this nature are not. Far-right President Jair Bolsonaro, who took office in January, has signed a decree making it easier for law-abiding citizens to own a gun, a key campaign promise, even though many restrictions remain in place. Raul Brasil school has some 1,000 primary and secondary students, aged between six and 18, and a language centre. It is located in downtown Suzano, some 50km (31 miles) from São Paulo. 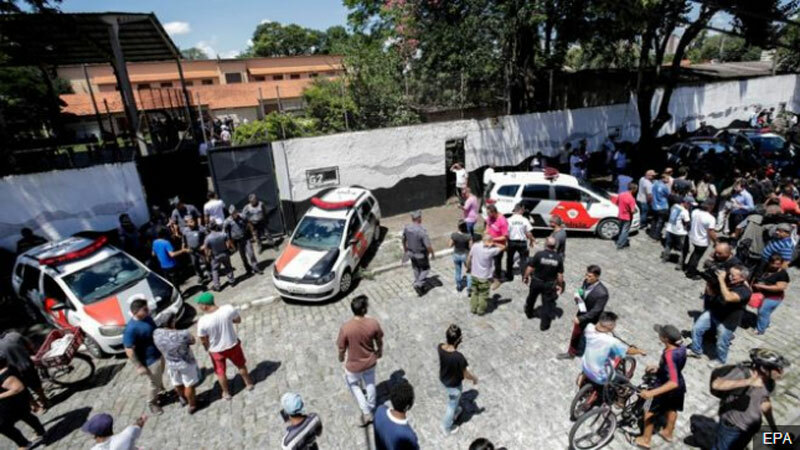 The gunmen entered the school and shot dead co-ordinator Marilena Ferreira Umezo, 59, before killing another employee, said Marcelo Salles, commander of police forces in São Paulo. They then killed and fatally wounded five students and injured several others before killing themselves in a hallway. Speaking to reporters outside the school, Mr Salles said that in his three decades with the police force he had "never seen anything like this". Only secondary students were at the school at the time of the shooting. Police arrived eight minutes after being called and did not confront the gunmen. "I was in the classroom during our break. I thought [the sound] was from bombs. When I realized they were gunshots, I stayed there. I only left when the police arrived," teacher Sandra Perez told O Estado de S.Paulo newspaper (in Portuguese). "It's a very sad scene, the saddest thing I've seen in my entire life. The teenagers were brutally murdered," São Paulo state governor João Doria said after visiting the school. A man was injured in another shooting near the school earlier, but police say they are still investigating if both cases are connected. The last major school shooting in Brazil happened in 2011, when 12 students were shot dead by a gunman in Rio de Janeiro.